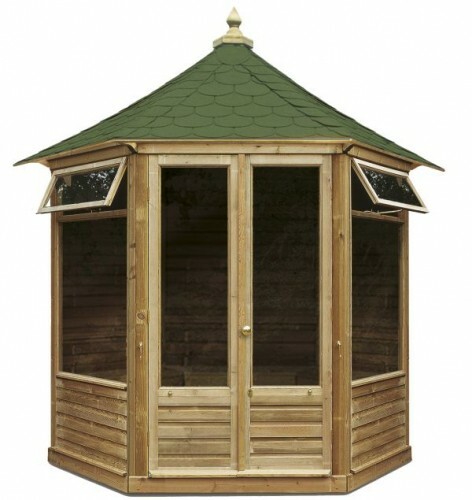 The Victorian Summerhouse is a traditional garden Summerhouse available in two sizes. It is a large wooden summerhouse with double doors that will provide plenty of room for entertaining or it can be used to simply sit and relax taking in the views of your garden. Manufactured from FSC approved pressure treated Northern European Redwood with the floor included. The windows and doors are fitted with 4mm toughened glass and the door fixings are manufactured from British Brass. The Victorian Summerhouse is delivered flatpack with instrucctions for self assembly.